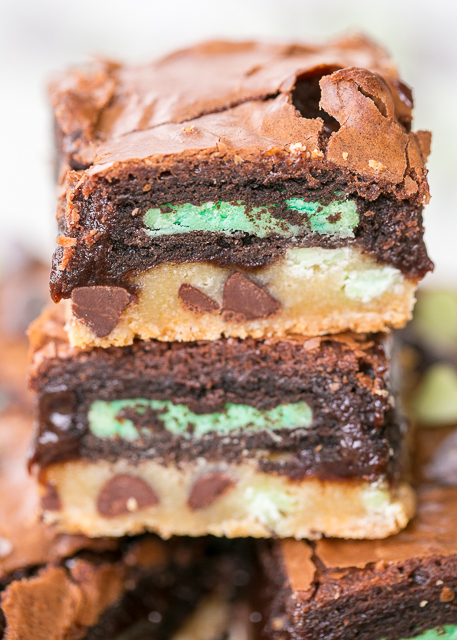 Mint Chocolate Slutty Brownies - seriously delicious! SO easy! 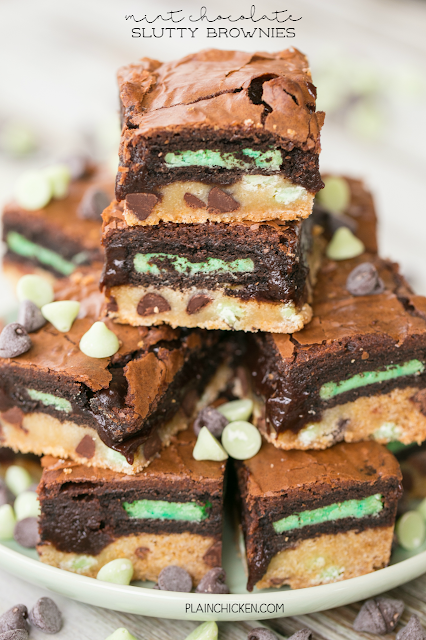 Chocolate chip cookie dough topped with mint oreos and mint brownie batter. I could eat the entire pan! Fun treat for St. Patrick's Day!! Slutty Brownies are all the rage on the internet. Have you had them? I've seen them online, but I have never had one. I decided to whip up a batch for St. Patrick's Day. I used mint Oreos and mint brownie batter in honor of the holiday. OMG! Where have these been my whole life?! Seriously delicious!!! The makeup of a Slutty Brownie is a layers of cookie dough, Oreos and brownies. They originated with my friend, Amanda (kevinandamanda.com). She didn't give them their famous name; it just came about via the internet one day. I am not a big sweets person, but I could not stop eating these Mint Chocolate Slutty Brownies! They were incredible! They are the perfect treat for St. Patrick's Day!! They will keep for several days in an airtight container. Whip up a batch today. I promise you will not be disappointed! Mix together cookie mix, butter and egg. Stir in chocolate chips. Press into bottom of prepared pan. Top cookie dough with Oreos. Prepare brownie mix according to package directions. Stir in mint extract. Pour over Oreos. Bake for 30 to 35 minutes. Remove from oven and cool completely before cutting into squares. ugh - stupid me Stef, but on the oreos, when you top with them, are they whole or crushed?? Going to make these today!! Can't wait!! Sorry lame question!!! I laid them on top of the cookie dough whole - not crushed. Enjoy! thanks so much Steph, and lo and behold I have all the ingredients!!! Enjoy!! I seriously ate way too many of these things. SO good! Why sugar cookie dough instead of chocolate chip cookie dough?